We have 5 moduLog glamping pods onsite. Each pod has been built from the ground up to provide you with holiday accommodation that is truly unique. We chose moduLog glamping pods as they are a bespoke unique design and have been constructed with homegrown timber by U.K. tradesmen, each pod is fully insulated using British sheep's wool. For more information on the moduLog pods please visit www.modulog.co.uk. 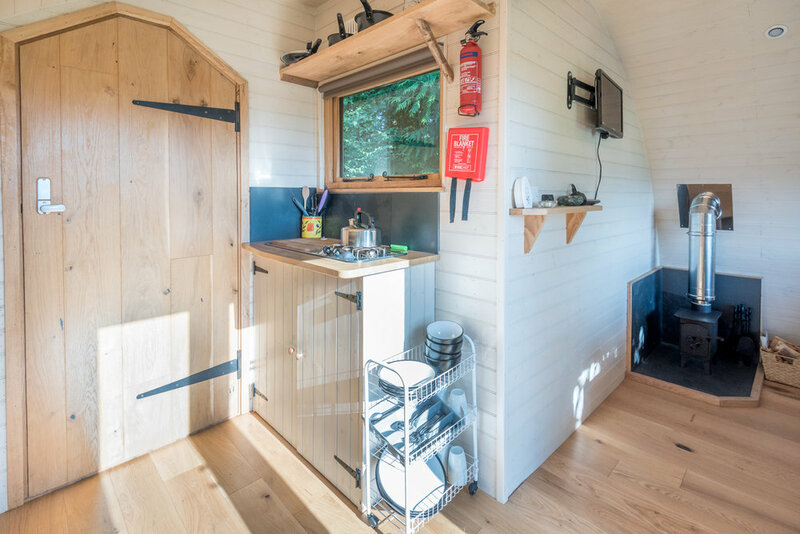 Our moduLog pods are off grid but fully equipped with a small kitchen with all the tableware and cooking utensils. There is seating/beds and double glazed windows for you to take in the breath-taking scenery of the woodland and surrounding countryside. Inside the pod you will also find a T.V./D.V.D player and log burner. As all of our pods are off grid they use Solar energy for LED lighting. 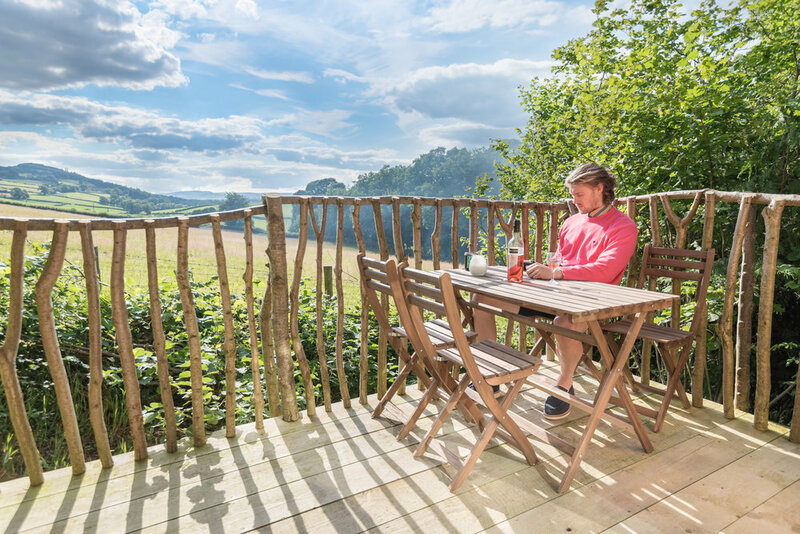 Each glamping pod also has its very own outdoor deck and BBQ area. After just a couple of nights in our pods there is a very good chance that you will feel at home. 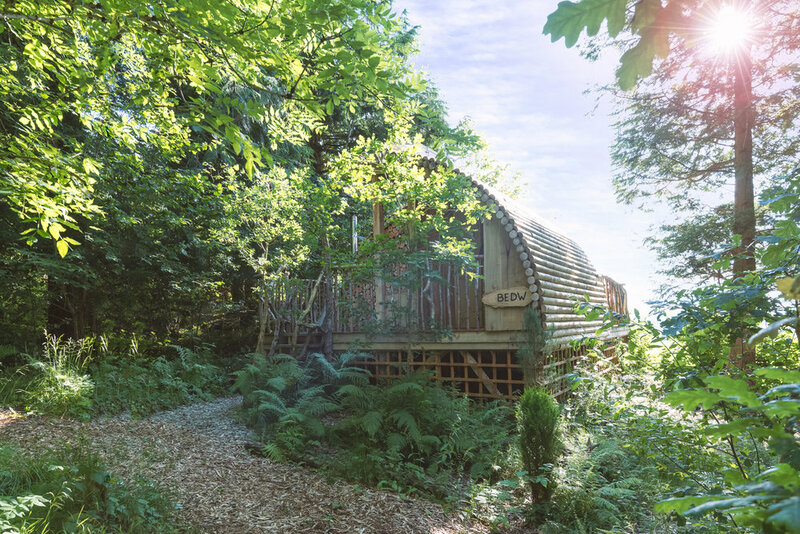 Our 5 moduLog glamping pods are the Bedw, Poplys, Celyn, Derw and Bothi. Each pod has a different design from one another which is one of the unique features of a moduLog pod which are available in all styles and sizes. The Bedw is one of our family pods which sleep 4. A covered porch at the entrance is perfect for taking off boots and coats. It has a 2 sets of box seating with storage underneath, the seats then turn into 2 double beds for sleeping. The Bedw has glazed french doors leading onto its rear decking where you have seating and private BBQ area. The Bedw has un-spoilt views of the Cambrian Mountains and the Mid Wales countryside with glorious sunsets. Like all of our pods it has everything you need except your bedding with bedding packs available if needed with a small hire charge. The Poply is also one of our family pods which sleep 4. The Poplys has a glazed front with glazed french doors leading onto its rear decking where you have seating and private BBQ area. The Poplys has also fantastic views of the Cambrian Mountains and the Mid Wales countryside with glorious sunsets. — Hanna & Carly, Beglan. 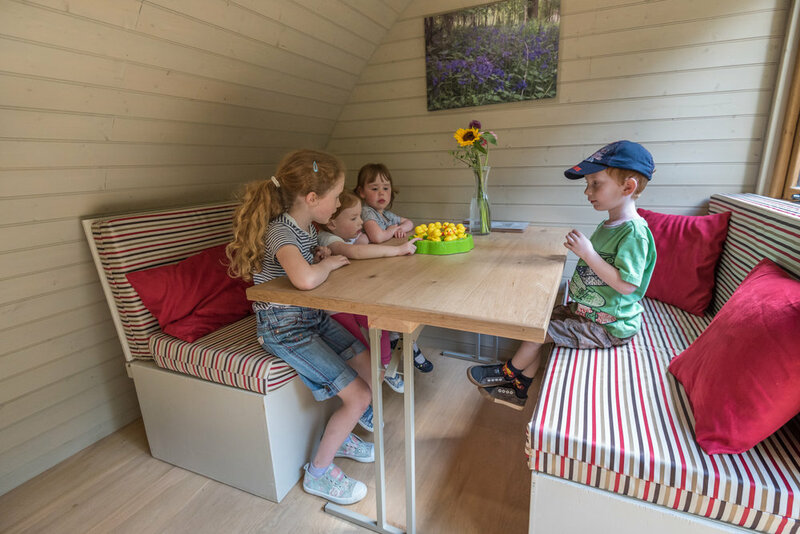 The Celyn is another one of our family pods which sleep 4. The Celyn has glazed french doors leading onto its rear decking where you have seating and private BBQ area. The Celyn has beautiful views of the Mid Wales countryside with glorious sunsets. 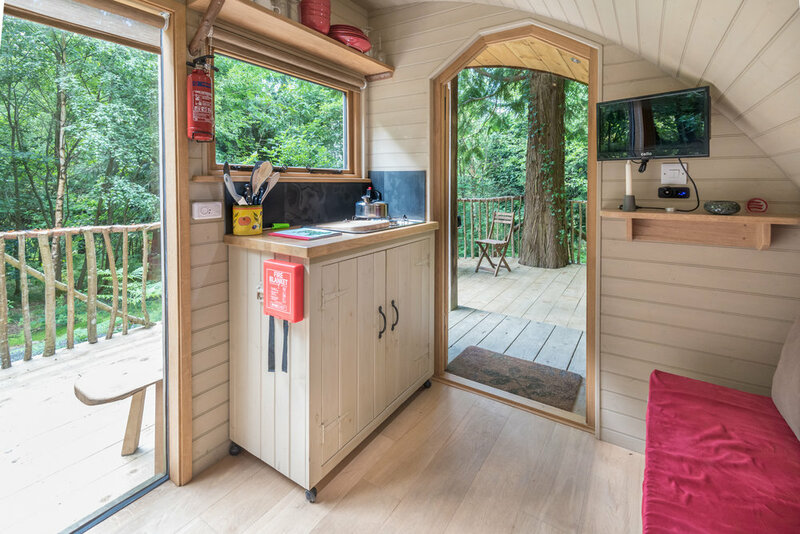 The Bothi is glamping pod which sleeps 2. It has 1 set of box seating with storage underneath, the seats then turn into a double bed for sleeping. The Bothi has glazed windows and full height double glazed panel looking onto its rear decking where you have seating and private BBQ area. 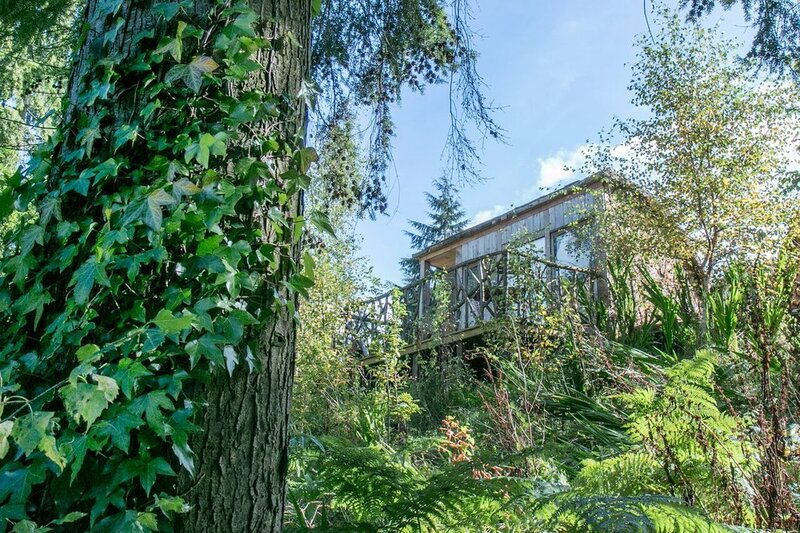 The Bothi is set in the woodland amongst the trees and wildlife and is great for bird watching. The Derw is another one of our family pods which sleep 4. The Derw has glazed french doors leading onto its rear decking where you have seating and private BBQ area. The Derw has beautiful views of the Cambrian Mountains with glorious sunsets. Our new tree house is here and available for bookings for 2018. Ty Coeden will sleep 6 with a double bedroom a twin room and a large sofa bed in the tree house lounge. There is also a kitchenette and dinning table with all the tableware and utensils supplied. There is also a T.V. and D.V.D player and electric heating throughout. Ty Coeden has is own private deck and BBQ area and compost toilet. 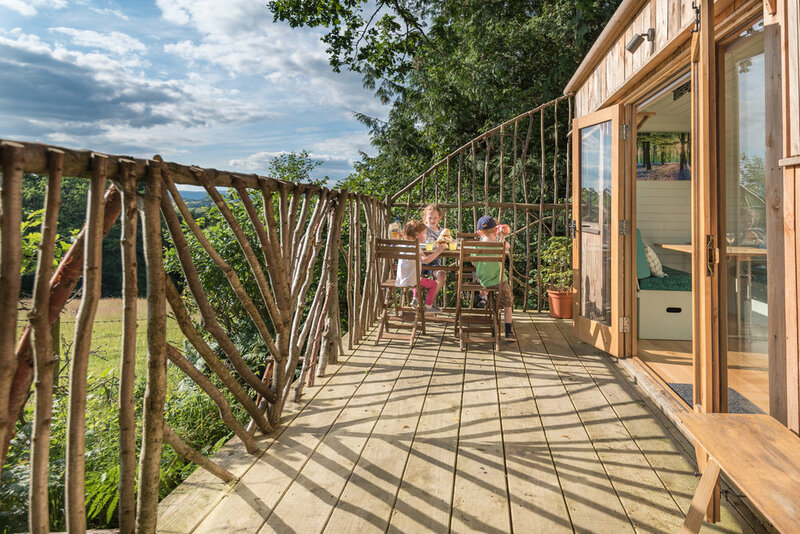 The tree house lounge has large glazed french doors leading onto the deck with un-spoilt views of the Welsh countryside. 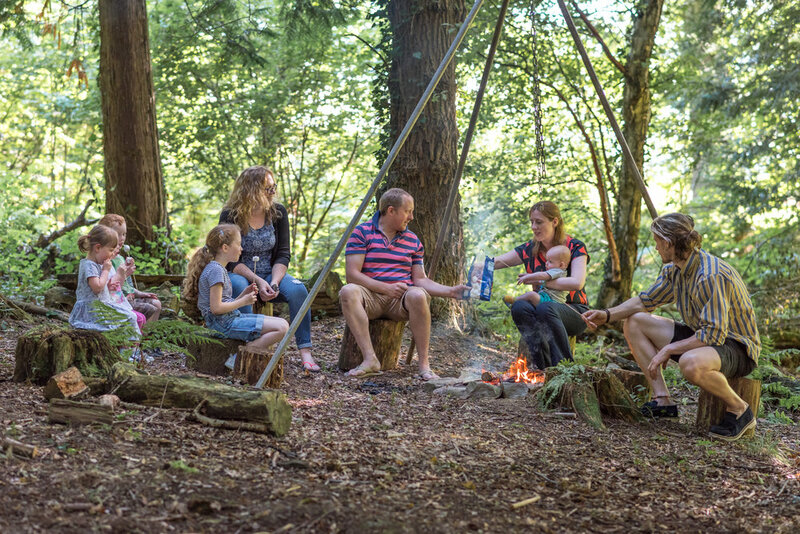 You still get the glamping feel staying in Ty Coeden with water collection and showers to be had from the hub which is just a short walk away along with the comunal BBQ area and pizza oven, fire pits and games room. Fancy camping in our woodland, we now have all weather tent pitches available. Each tent pitch is made of artificia grass for all weather use and is designed for a family tent with pitch size approx. 5m x 3.5m. All pitches have their own BBQ area and picnic bench and access to the campsite fire pit. All campers have access to our amenity hub and site facilities. Tent pitch with Tunnel tent, 2 x blow up double beds £35 per night.